You’re not anyone in this town unless you have your own full HD pocket cam. Well, that’s not entirely true, but I’m sure that’s what all the people with compact HD cameras are saying. Forget it being the year of the Cow, this is truly the year of the HD camcorder. So far, Xacti, Toshiba and Samsung have all brought delectable HD offerings to the market. 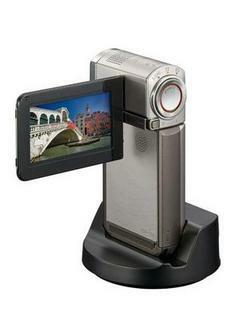 Today however, the spotlight shines bright on the Sony Handycam TG7VE. But it’s not just a good looking HD cam, it’s the world’s smallest full HD camcorder… with GPS capabilities. This means the camera comes with the ability to view image locations on its map (and forever remember where it was you saw that person doing that in public), complete with pinpoint graphics. With its 2.3 megapixels you can capture around six hours of video onto its 16GB internal brain space and view it all on its 2.7-inch LCD screen. Throw in a Carl Zeiss lens, a 1/5-inch CMOS sensor and a Bionz processor and you’re onto an assured piece of quality camcording kit. It shoots stills at 4 megapixels, provided up to 10x optical zoom and comes with the usual camcorder guff such as face tracking and smile shot functionality – which also works in video capture mode. There’s no pricing deets at the moment, but it makes its official appearance in May and will come bundled with an additional 32GB memory card and wide angle cap.